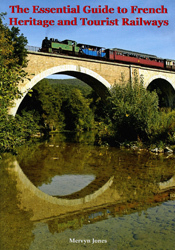 This guide is intended not only to appeal to railway enthusiasts but to those holidaymakers and travellers, francophiles perhaps, who love France and wich to see this beautiful country from a different perspective. The book has identified a total of 160 locations where heritage and tourist railway activity can be found. In summary, identified in these pages is a collection of 81 heritage and/or tourist railways. Of these, the situation at the end of 2005 was that 71 are still active, four have temporarily (hopefully!) suspended their operations, a further four are active development projects and not yet fully operational and, finally, there are two railways, one of which straddles the border between France and Luxembourg and the other very close to it just inside Luxembourg. The latter, whilst obviously not in France, is so close to the border and is just too good to miss, hence its inclusion. Also listed are 19 of the most scenic TER-SNCF railway routes and 24 museums, one of which is closed (AMTUIR in the �le de France region) but it does open on special occasion and possibly on request. A further 19 locations and/or organisations have been identified where mat�riel roulant – locomotives, autorails, carriages and wagons – have been preserved and are exhibited or in some instances are stored. Much of this rolling stock, lovingly restored, and maintained, has been approved for excursions on R�seau Ferr� France (RFF) – Soci�t� Nationale des Chemins de Fer Fran�ais (SNCF) tracks, usually on Sundays when regular services are reduced. Included in this number are some other organisations which organise excursions using preserved locomotives or autorails. Seventeen places are listed where v�lorail facilities are available. Finally, to clarify the current position in France, a further nine tourist railways have been briefly listed (not part of the total 160 mentioned above) which are no longer in business. Many of the railway identified here travel on routes, long and short, invariably through outstandingly beautiful countryside with a few others operating on purpose-built track laid in country amusement parks, thus offering something for all the family. In addition, the v�lorail, for example, is a recent phenomenon in France and another facility that has universal appeal to families. There are two basic types of ‘locomotion’ – one form is effectively two pedal cycles (v�los) welded together by a metal frame to which is fitted a bench seat for the non-pedalling passengers or for luggage; and the other, a cyclo-draisine with wheels between 10 and 20 centimetres diameter and is a variation on a traditional self-propelled railcar. Both types of machine require human energies to be expended, but the benefits of v�lorail journey brings is a worthwhile form of exercise and a pleasant group activity, as well as an opportunity to appreciate the countryside as viewed from a former local railway route. A5 format, 192 pages, 93 illustrations.